In this game the beautiful princess of India must run to her palace. But on the road princess meets many obstacles like elephants, cows, snakes and autorickshaws. 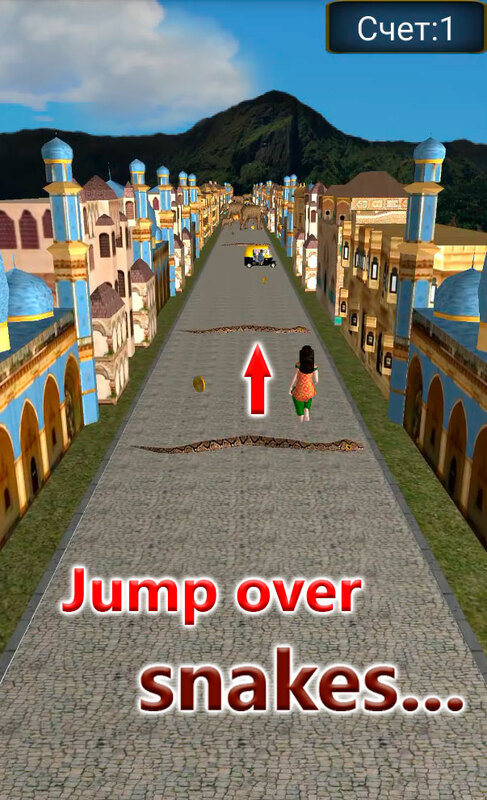 Running princess has to jump over snakes, slide under elephants and run around cow and autoricshaws. This runner game has easy control so even kids can play in it. Swipe left or right to turn, swipe up to jump or swipe down to slide. But you should have enough skills to overcome all obstacles and save the princess. If the level number is red, this means that you have done is not good enough. Try again! You can achieve the best result when the level number will be green! The game have global ranking table. Arrange competition with your friends and beat your friends high score! Or maybe you are so good player that you can become the best player of the world?! Don't forget to collect coins to buy a new dress. You can dress up princess in indian style dress - "salwar kameez". Choose different materials and change the color of the dress. 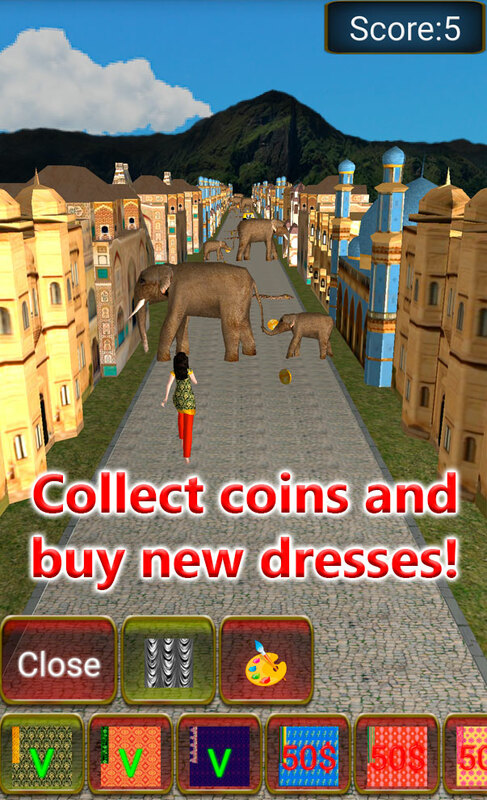 Discover the wonderful and incredible India with this realistic game with 3D graphic. You will run to the palace along the Indian street with beautiful houses, temples and mosques. Around the princess are indian elephants, cows and usual for India transport - autorickshaws. It's not just a runner game, it's almost like a little trip to India. 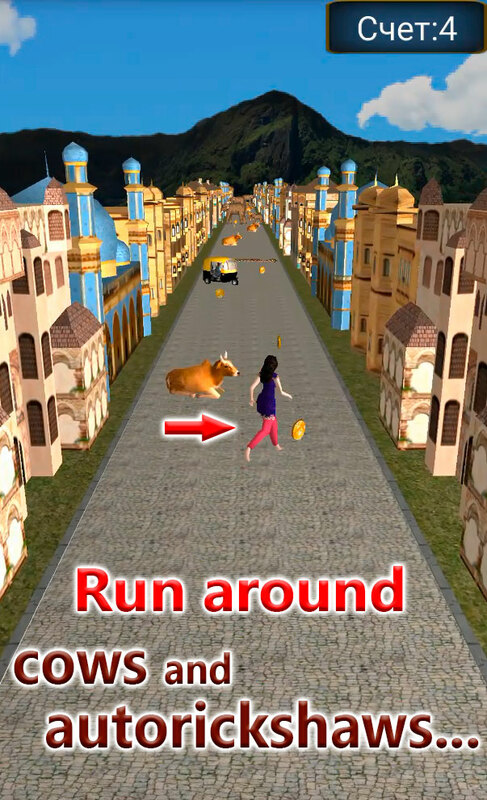 This 3D game for everyone who loves runner games. Especially the game will be interesting for girls - the beautiful princess, a variety of dresses, easy control and colorful grafics will make this game your favorite runner. 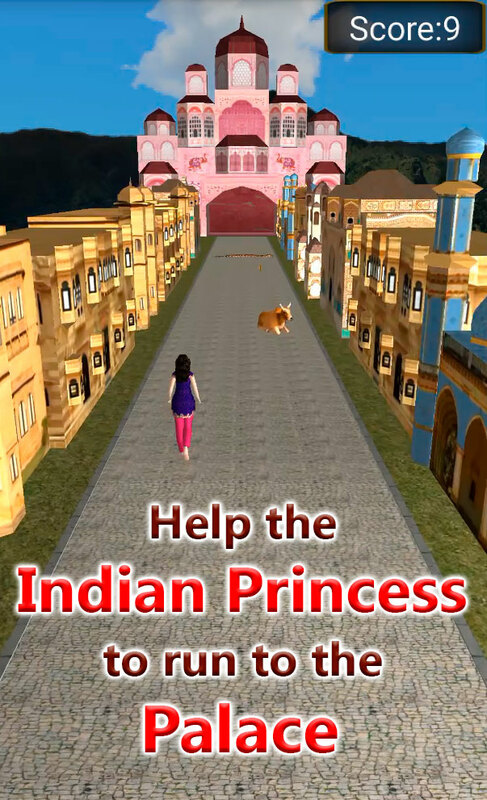 Realistic 3D graphic - princess runs along indian houses, temples and palaces. Elephans, autorickshaws and cow looks like real too. Many obstacles to jump over, slide under and avoid.